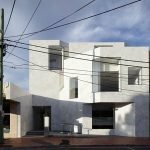 A marble-clad exterior is just one of the awe-inspiring elements in this newly designed practice in the Melbourne suburb of Beaumaris. It’s common for diligent dentists to refer to their practices as a ‘home away from home’, but for Dr Valence (Val) Roberts, his surgery and residence are beautifully entwined. His private apartment is directly above his recently built surgery. 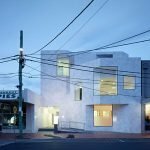 Located in Beaumaris, 20 kilometres southeast of Melbourne, the bc dental practice has been recently transformed into a beacon of style and substance. Its visionary design, high-tech equipment and thoughtful functionality and ergonomics have been embraced by Dr Roberts and his team of seven practitioners. But the real coup is the inviting courtyard that can be viewed from most of the surgeries and his third-floor apartment. Now a three-storey 670-square-metre structure, the four-surgery practice is located on the ground floor, and a commercial dental lab, The Smile Laboratory, is about to open on the first floor early next year. 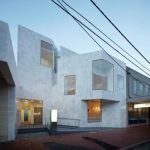 When it came to the aesthetics, however, Barkla was given free rein on the design and materials of the practice. 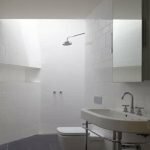 “We looked at what they do as a craft and that led us towards a very polished veneer of white glazed marble flush to the glass. 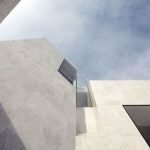 The marble has a degree of translucency, and the glass at certain times of the day looks opaque so from an oblique view, it looks almost solid,” he says. 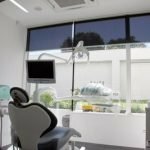 Barkla worked with dental design consultancies to ensure the layout of the practice was functional, while Dr Roberts also commissioned Sam Russell from Create Dental in the later stages of the fit-out to ensure the final touches were perfect. Barkla also included a clever future-proofing option for when the dental chairs need to be replaced. The concrete directly under the chair is a different mix that can be easily removed to adjust the pipework required for a different type of chair. One specific request came from Carlo, who’s been specialising in treating nervous patients for the past 30 years. He made sure the TV screens installed on the ceilings have subtitles and wireless headphones so the noise doesn’t distract the dentist and dental nurse. “We went to a lot of trouble to locate the TVs so they wouldn’t be obstructed by the light,” explains Barkla, who was so impressed with the practice, he’s now a patient of bc dental. As an extra bonus, patients can also select suitable music through Spotify, an online subscription music service. 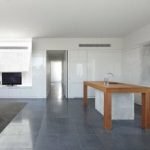 The building was finally completed in late 2011 and although the project exceeded the initial budget, Val was delighted to both live and work in his new property. 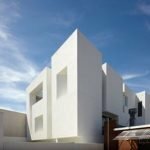 “Since it was a complicated build, it took more time and money than we ever expected,” he says. But overall, he’s still excited about living and working in this highly lauded practice. 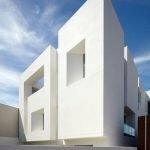 Apart from being short-listed in the Australian Institute of Architects Awards’ Commercial Buildings division, it’s been published in architectural magazines in Australia, Korea, China, Poland and the US.